Love is in the air with this quilt! 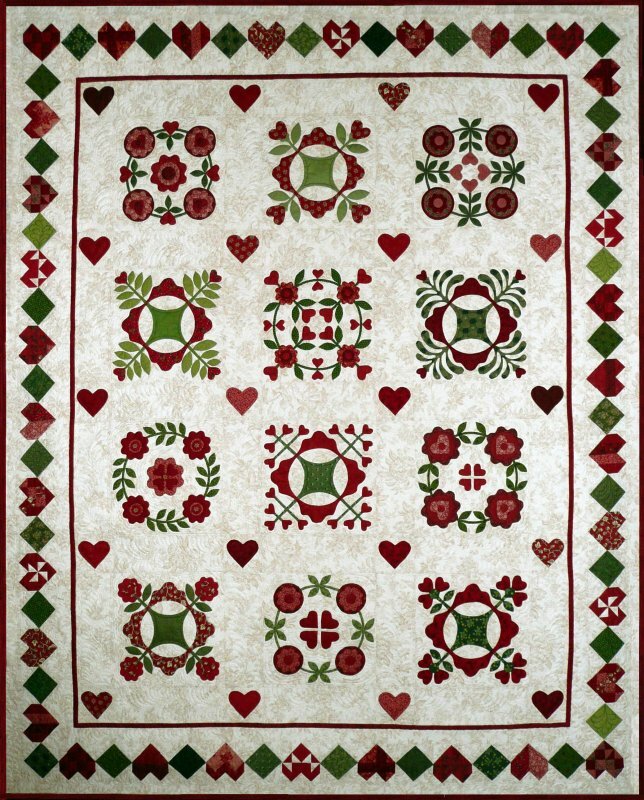 Hearts in Bloom is a 68 by 87 inch quilt filled with appliqued hearts and flowers blocks, all surrounded by a border of 4-inch pieced hearts and square-in-square blocks. The quilt is designed as a block-of-the-month quilt but you can buy the patterns for the whole quilt, as a set. There are six wreaths of hearts and flowers and six variations of an oak leaf reel block, with a modified "reel" and an "x" of leaves and hearts or flowers. Instructions for the pieced heart patterns and square-in-square patterns are included in the monthly patterns. While this quilt was done as a red and green quilt, you could just as easily make it from any other color set - use whatever colors you wish and enjoy the journey!